E-DAY fun is coming up soon! October 13th grades K-4 will be going to TN Street Park in Savannah, TN. October 14th grades 5-8 will be going bowling at 10 Pins Bowling in Lexington, TN. Students must meet the following requirements to attend E-DAY. 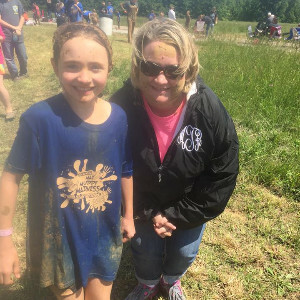 Westover Elementary PTO 3rd annual May Muddy Madness was held Saturday, May, 14, 2016, at the school. 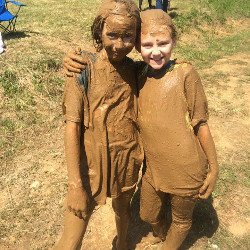 Everyone had a great time playing in the mud, visiting with friends, and eating a burger, hotdog or snow cone. 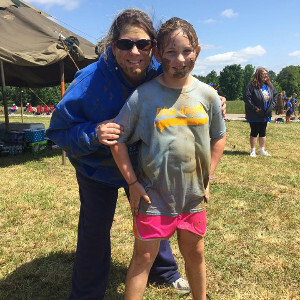 May Muddy Madness is a fun filled muddy day at Westover Elementary School. 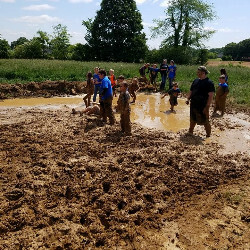 The muddy obstacle course with large mud pits is always a favorite of the kids. 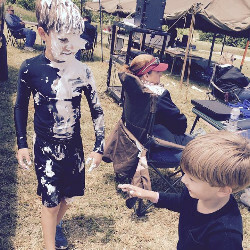 Other fun events for the day include pie in the face and a dunking booth. What better way to say thank you after a fun year than to dunk your favorite teacher or principal in the dunking booth! 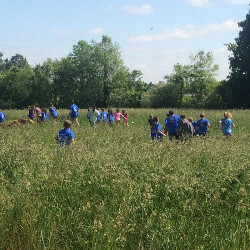 This year we also added muddy dodge ball and it was a hit! Fire Station 11 from Luray was on hand to hose off all the muddy folks and enjoy the festivities. On behalf of Westover PTO, we would like to thank the following sponsors: All-Around Laser Imaging, Anderson Sporting Goods, Beech Lake Marine, Deco Fireworks, Land Development Group, Save A Lot, and Zaxbys. We are so thankful to have such great businesses in our community willing to support our school. Westover PTO would also like to thank all of our parent and teacher volunteers for their help. 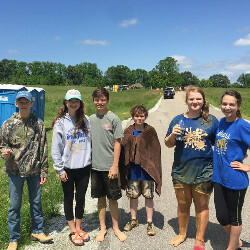 Our muddy fun day wouldn't be the success it is without their help. More Playing in the Mud!! Firemen Sprayed Our Kiddos! And Provided Lots of Water! Ready to Be Hosed Off! PTO Officer Mom and Daughter! Another PTO Officer Mom and Daughter! Most of you have received a name tag for your vehicle if you pick up your child by car. Please contact the school if you did not receive one. Preferably a note sent to teachers listing all of your children on one note. Thank you for your cooperation and patience that you have shown during our car pick-up. Our main concern is for our students. Everyone is working together to make our car pick-up work more efficiently. Balfour will be at the school on Sept 9 to take deposits and size students rings. The deposit is $40.00. Please make checks and money orders payable to Balfour. Students are designated as a bus/car rider in order for that student to be dismissed at different bells. Students going home a different way or with another student must provide a note with parent permission from both sets of parents. PLEASE AVOID PHONE CALLS TO THE OFFICE CONCERNING DISMISSAL UNLESS IT IS AN EMERGENCY. Please make your child aware of any different arrangements before they come to school and send a written note to the teacher. School attendance and promptness to classes are important to the Henderson County School System. Time on task is essential if students are to succeed in their educational efforts. The right to attend public school places the responsibility on pupils and their parents to strive for perfect attendance. Tardiness, absences, check-outs and suspensions are all problems that require action by the school officials because each of these results in a loss of time on task. Absences shall be classified as either excused or unexcused as determined by the principal or his/her designee. After 5 days is unexcused absences or tardies, the parent will be contacted by the principal or his/her designee. When the student accumulates 7 unexcused days or tardies, the student and parents/guardians will be summoned to appear before the Truancy Committee. Parental Permission absence shall be recorded as UNEXCUSED. Full details are in the agenda and handbook. Coordinated School Health Screenings will be conducted on Sept. 9 for all even grades. Please be sure to wear your glasses if you have them. Parent-Teacher Conferences are schedules for Thursday, Sept 17 from 1 pm to 7 pm. Teacher will be in staff development meetings that morning and will be unable to begin conferences until 1:00. We hope to see you there. Kids are more successful in school when parents take an active interest in their homework - it shows kids that what they do is important. One tip when helping with homework is to make sure kids do their own work. They won't learn if they don't think for themselves and make their own mistakes. Parent can make suggestions and help with directions, but it is a kids job to do the learning. We are having a decorated pumpkin contest starting Thursday, Oct. 27th and ending the Friday of our Fall Festival, November 4th. If your child would like to enter a pumpkin the entry fee is $3.00. The pumpkin CANNOT be cut or carved in any shape, form, or fashion. Pumpkins may be painted, glued, glittered, etc. on the outside. Entry fees and pumpkins must be turned in by Monday, October 31st. You may vote for your favorite pumpkin with a ticket. Tickets will be sold 2 for $1.00 and may be purchased in the mornings or during your break time. Winner will be announced Monday, November 7th and will receive $20 and their picture will be in the Lexington Progress. The Link for Westover's "Camp-out with a book"
Countdown to Kindergarten!! Please clink on the above caption. Everything you need to know about Kindergarten registration!!! Hello faithful readers! I just wanted to send a quick shout out and remind everybody about the changes made to our TN Ready part 1 testing window and procedures. ALL testing will be done by paper and pencil. We will begin testing English, Language Arts on March 1st. March 2nd will be a regular instructional day. March 3rd will be Math, and March 4th will be Social Studies. Remember that a good night’s sleep and a warm breakfast (breakfast is served here for Free!) will be AWESOME for our kids to ensure they perform their best on the TN Ready! Report cards will be going out on March 10th! Spring Pictures are coming up as well on March 17th. This will include Spring, Kindergarten cap and gown, and Volleyball pics. Parent Involvement, PTO, and STUCO are at it again! We will be having another community night entitled Camp Out with a Book night. Camping will begin at 5:30 and run to 6:30 with scavenger hunts, reading campsites, and reading trees with AR tests. We encourage you to bring a flashlight, and themed food including s’mores will be provided! Afterwards, STUCO will be continuing to read and test with your kids while you go and attend our PTO meeting. This way you can have a say in what is happening at our school, and your kids will be having FUN while you do it. For all kiddos that will be starting Kindergarten next year. Please attend our Kindergarten Registration day on March 10th from 3:00-6:00 p.m. This helps us to prepare for our incoming Westover Cubs, so, we can give them the best experience out there! March 1-4- TN Ready testing for grades 3-8. We would like to invite you to our first annual night registration on July 27 from 6 PM to 8 PM. It is important to us to accommodate our parents' schedules as much as possible. This early night registration is open to all parents to enable them to come and update registration cards, meet grade level teachers, and meet new PTO officers. We will have activities and ice cream sundaes for the students in the gym while you fill out paperwork and meet the grade level teachers. Please come be a part of our welcome back party! Regular registration will still be on Aug. 1 from 7:30 - 11:30 if you cannot make our night registration. No School for students on Aug. 2. This is an Administrative Day for teachers. The First Full Day of school is Aug. 3rd. We are getting very excited to welcome our students back. Congratulations to 8th grader, Garrett Weinberg, for finishing 2nd place in the County Wide Spelling Bee. All three students from Westover who attended the County Wide Spelling Bee placed in the top 5! Riley Robertson, 7th grade, finished 4th place and Ryder Blankenship, 5th grade, finished in 5th place. We are so proud of our awesome spellers! Stop by our Christmas Store for ornaments and other Christmas items. Come to the fright fest at Westover Elementary and be "haunted"
Friday, November 4th 6:30-8:30 at the Fall Festival. Get in once free with a bracelet...IF you survive, go through again with 2 tickets. Henderson County and Paul G. Caywood School educators and other area officials will join forces on Thursday, March 31, at the Everett Horn Public Library in Lexington from 6 PM until 8 PM – registration begins at 5:30 PM -- to Countdown to Kindergarten. Parents who have a youngster going to Kindergarten for the first time this coming fall are encouraged to attend this free workshop. Those attending will get expert advice, learn helpful hints, and hear insider secrets that can make going to Kindergarten exciting and fun for both children and parents. The first 50 kids will receive a free “I’m Going to Kindergarten” t-shirt. Countdown to Kindergarten is sponsored by WLJT-DT, Everett Horn Public Library, The Library Friends, The Henderson County School System and Paul G. Caywood School. Call 731-968-3239 or 731-881-7561 during regular business hours with any questions. Lost and Found is overflowing. Be sure and check for articles that your child might have missing. These items will be donated to charities this summer. Drop offs will not be allowed at the event. Parents must e present with their children. All proceeds will benefit the Westover Elementary School PTO. * Please see the May Muddy Madness flyer that was sent home for additional information regarding activities at the event and costs. The Westover Band will have a concert on Thursday, May 5 at 6:30. Please come and support the talented band students. All school debts must be paid before report cards can be released. Please verify that your child has no textbooks, library books, or cafeteria debts. If no money is owed to the school, the report card may be mailed to you if a stamped addresses envelope has been supplied to the teacher before this date. No child may be checked out of school before 10:30 a.m. on testing days to ensure they have time to do their best on the final exams. *Please have your child bring sunscreen, hats, change of clothes, towels, ice cream money, etc. for this fun filled day. PTO meeting will follow presentations. As an alternative to Meet and Greet, Westover invites you to join us for Parent Awareness. Presentations will contain helpful study tips as well as information about school policies, procedures, and expectations. Teachers will provide helpful study tips that can be implemented at home. This night will contain strategies to involve parents in helping their children do well in school. If unable to attend please schedule a conference at the upcoming Parent/Teacher Conference. Friday, August 19 at 8:00 p.m. Please make plans to attend this fun event. For only a $4 donation, you will receive popcorn and a drink to enjoy during the movie. You can pre-register by August 11th. We can't wait to see you there! Drop and Read on April 29! Please support your child & help your family save money too! Get INVOLVED!! Buy a Smart Savings Card with more coupons and Virtual Smart Card. Every purchase comes with 28 more coupons and a free download of our virtual Smart Card! Lexington savings! Zaxby's, Goodwill, Dairy Queen, Subway and a several more places! !The Smart Cards are $15 dollars. We would like to welcome back our Students, Staff and Faculty. We are looking forward to a great 2015-16 school year. We would like to welcome our new staff and faculty: Michelle Roberts, Paraprofessional Pre-K, Kaitlin Thompson, Sped, Kim Tilley, Sped and Jodi Duncan, 8th Science/Social Studies, Robert Eskew, Band Director, Kelly McAdams, Resource, Kassie Overman, 2nd grade, Amber Tulley, 2nd Grade and Elizabeth Vineyard, CDC Teacher. We also have some new additions to our custodial staff, Redonna Phillips, and also to our Cafeteria staff: Terrie Walton, Ivy Jamiesom and Melody Vandergriff. We are happy to welcome you to the Westover Family.